The History Dialog displays the list of the documents you have opened in previous sessions. It is more complete than the list you get with the “Open Recent” command. The “History” dialog is a dockable dialog; see the section Paragraaf 2.3, “Koppelen van dialoogvensters” for help on manipulating it. From an image menu: Windows → Dockable Dialogs → Document History. From the Tab menu in any dockable dialog by clicking on and selecting Add Tab → Document History. From the image Menu bar through: File → Open Recent → Document History. The scroll bar allows you to browse all images you have opened before. In the Tab menu for the “Document History” dialog, you can choose between View as Grid and View as List. In Grid mode, the documents are laid out in a rectangular array. In List mode, they are lined up vertically, with each row showing a thumbnail of the contents of the image, its name, and its pixel dimensions. Use the Open the selected entry button or Open Image command of the dialog's context menu, to open the image you have selected. With the Shift key pressed, it raises an image hidden behind others. 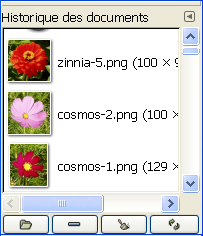 With the Ctrl key pressed, it opens the Open Image dialog. Use the Remove the selected entry button or Remove Entry command of the dialog's context menu, to remove an image from the History dialog. The image is removed from the recently open images list also. But the image itself is not deleted. Use the Clear the entire file history button or Clear History command of the dialog's context menu, to remove all the files from the history. Use the Recreate Preview button or Recreate Preview command of the dialog's context menu, to update preview in case of change. With Shift key pressed, it acts on all previews. With Ctrl key pressed, previews that correspond to files that can't be found out, are deleted.